Looking back at year’s end to assess accomplishments and plan ahead seems to be human nature, and in business, measuring growth or contraction in neat 12-month blocks is certainly handy. However, in fact, commercial activity is rarely that tidy. This is particularly true in the satellite industry, when business cycles last for many years and long-term planning looks ahead as much as a decade. Thus, 2014 cannot be seen in isolation for Intelsat General and our business of providing satellite communication solutions to our customers, in particular, the U.S. and allied governments. In addition, measuring a year purely by the numbers ignores some major milestones such as progress on hosted payloads, acquisition reform, and ground control networks, as well as the quick restoration of service to the Navy after a disastrous wildfire. This past year was part of a cycle that we anticipated as far back as 2008, when anyone paying attention understood that the United States would not continue military operations in Iraq and Afghanistan indefinitely. Three events dramatically shaped our business. First, the troop drawdown reduced demand by military forces for satellite services provided by our company and many others. Second, U.S. government deficit concerns and the accompanying across-the-board spending reductions required by “sequestration” led to efficiencies and reprioritization within the DoD. At the same time, the U.S. military continued deploying its Wideband Global SATCOM fleet, bringing more of its own satellite capacity on-line. While these factors have led to less government requirements for commercial satellite services when compared to a year ago, we think that 2014 was but a slight pause in the ever-upward demand curve for satellite services. From collecting data from unmanned aerial vehicles (UAVs) to delivering movies and email to crews aboard Navy ships, satellites are playing a larger and larger role each year in satisfying the communication demands of military forces and governments worldwide. Plus, there is widely accepted agreement that government-owned satellites cannot serve all of this demand. • Awarding the first contracts under the Hosted Payload Solutions Program, known as HoPS. We have been advocating since 2006 that commercial satellites be used to host military payloads as a means of getting capacity into space quickly and affordably, and HoPS provides a contracting vehicle to do this. • Awarding Intelsat General a contract to study the viability of the U.S. government to leverage commercial infrastructure, processes and resources for the tracking, telemetry and command (TT&C) of certain government satellites. Using a company such as Intelsat, which supports approximately 75 spacecraft built by every major satellite manufacturer, could allow the USG to divert critical resources toward other space objectives and warfighting needs, while increasing reliability and diversity. We also made major strides in our on-going efforts to change government acquisition policies related to satellite services. Representatives from both the U.S. Congress and the DoD began actively supporting the use of multi-year contracts for these services, compared to the one-year-term contracts in use today. We will continue to work with the Congress and the DoD to ensure they have clear statutory authority to do so. Such a step would reduce the cost of these services to the government user and enable commercial companies to better plan how to meet government demand over the long term. 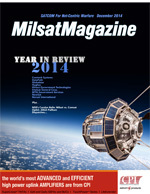 One specific and quite significant accomplishment in 2014 at Intelsat General, which didn’t receive a great deal of publicity, began as a disaster and ended as a case study in how to quickly and effectively respond to emergency customer needs. The worst fire in Washington State’s recorded history, known as the Carlton Complex wildfire, destroyed more than 300 homes over a two-week period. 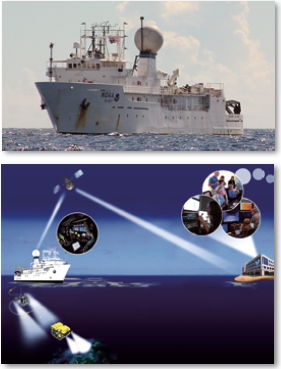 In the late night hours of July 17, the fire burned terrestrial cable connections to the USEI Teleport, which provided Commercial Broadband Satellite Communications Program (CBSP) services to the U.S. Navy, which was in the midst of a large-scale, multi-national exercise far out in the Pacific. As the lead company on the CBSP contract, we quickly put our response plan into action. The recovery solution involved adding more satellites, transferring ground services to other teleports, and developing new link budgets for this entirely new network. One particular challenge occurred at our Paumalu, Hawaii, teleport, where one of the antennas needed for restoration of service had been disassembled in preparation for a scheduled overhaul and upgrade. This antenna had to be reassembled in the dark—it was 3:00 a.m. in Hawaii—and tested to support the transition. Engineers restored service to the first ship within about five hours, and service to the other vessels soon followed. The team provided all restoration services and link budgets to the Navy in less than 15 hours, allowing shipboard technicians to make an orderly transition to the new services well within the expected timeframe of everyone involved. Looking ahead, Intelsat will reach a major milestone in 2015 with the launch of our first high-throughput Intelsat EpicNG satellite, set for the second half of the year. The EpicNG satellites will use tightly focused spot beams and high power to deliver data at rates never before seen in the satellite industry. A thorough analysis conducted jointly by engineers at our company and at L-3 Communications – Communication Systems West found that the EpicNG satellites will significantly outperform existing Ku-band satellites in AISR communications. The study also provides further evidence that the government can avoid the time-consuming and expensive task of installing Ka-band terminals on the nation’s fleet of unmanned aircraft as they can achieve their desired data rates and performance well into the future at Ku-band. The EpicNG spacecraft now being built are larger and more powerful than any Ku-band satellites ever put into orbit. In addition to the higher throughput, the EpicNG satellites offer a number of other advantages over existing Ku- and Ka-band, such as higher protection against intentional, as well as unintentional, jamming. The EpicNG satellites will be fully integrated into the Intelsat fleet—a user will be able to easily transition from a wide-beam Ku- signal to an EpicNG narrow beam. Our industry is on a long, upward trajectory of providing more capable and secure satellite services to governments worldwide—2014 was part of that trend. As with all businesses, we will experience dips in the road—some of which we can predict and others which we can’t. Our job at Intelsat General is to continue providing the best service we can under any circumstances, as we did with the Brewster fire. We look forward to continuing that standard in 2015. Kay Sears, President of Intelsat General, is responsible for implementing the company’s strategic and operational plans and for the overall mission of providing a range of sustainable, cost-effective and secure communications solutions to government and commercial customers. She has worked more than 25 years in the satellite communications industry, including extensive experience in rapid-response solutions for both military and civil agencies of the U.S. government. Ms. Sears has spoken widely on how commercial satellites can be utilized by the military to solve mission-critical needs and she has worked over the past several years to advance the commercial / DoD partnership. In 2009, Ms. Sears was appointed to the President’s National Security Telecommunications Advisory Committee (NSTAC) to provide information, technical expertise, advice and guidance regarding issues that may affect national security telecommunications capabilities. Before joining Intelsat, Ms. Sears helped launch government services business units at both G2 Satellite Solutions and Verestar. Ms. Sears has also held sales and product development positions with Intelsat and Comsat World Systems. The year started with a bit of a challenge as iGT and the rest of the government industry continued to recover from one of the hardest congressional decisions ever—"The Sequester." This is a word that still causes me to wince as though someone was striking an out-of-tune piano key. The effects of the sequester, the furloughs and the government shutdown can still be felt today as we prepare for the new Congress to take office. The biggest lingering effect, from my perspective, has been the slow-down of the entire government contracting process, causing a delay to most of the companies on contract awards and subsequently revenue. As I anxiously await the arrival of the 114th Congress, I can only hope that Congress enters with an improved attitude of cooperation on both sides of the aisle and is ready to take on the challenges ahead. While 2014 will end a little light on our revenue side, the one element that remains crystal clear is that both the government satellite market and the satellite industry will remain solid and strong. This was a wonderful year in terms of market development, product development and technology improvements. At iGT, 2014 saw the release of our new software that will allow for the use of adaptive coding and modulation (ACM) on all of the Evolution products currently fielded. We have used ACM for many years on the outbound channel from our hub, and we finished the software to allow the remote terminal on the inbound side to use this feature. The great advantage of this feature is that it allows for tremendous flexibility and efficiency in the entire network. No longer do we have to design the network for the most disadvantaged terminal. Each terminal can stand on its own and use the inbound channel that is most efficient for its geographic place in the satellite footprint and environmental conditions, allowing for the maximum data rate at any given moment. As with most companies, we are constantly looking to improve our products and utilize the next generation of technology for the benefit of our customer base. While it always seems to take a little longer than we’d like, the results are always amazing, and the developments we have undertaken throughout 2014 are no exception. iGT has three new modems under development, and we hope to have two of those products out by mid-2015. The first development is our new 950mp (man-portable) modem, which is our replacement product for our tremendously successful e850mp. The e850mp was designed specifically to be integrated into a very small man-portable terminal for rapid deployment. The original development of the e850mp was impressive, but the new 950mp will take the technology to an even more amazing height. I didn’t believe it was possible, but the engineering team has been able to cut the size of the board in half, all the while simultaneously cutting the power consumption in half, cutting the weight in half and more than doubling the device’s performance. The benefit of this reduction in size, weight and power is that our integration customers will now be able to design smaller, lighter terminals for our government customers—they will be able to operate at a higher speed while requiring less power and generating less heat. Additionally, the new modem will operate over all commercial satellites, WGS, the new Inmarsat GX constellation, as well as other high throughput satellites. 2014 saw the rapid development of another new piece of hardware for iGT, the 9350. The 9350 will become the replacement product for our rock-solid e8350 rack-mount modem. The 9350 comes with a host of new features and capabilities, as well as the addition of a second demodulator. Like the 950mp, the speed and throughput of the 9350 have been improved dramatically over the e8350 and our customers will benefit from an immediate packets per second (PPS) improvement on their current networks at their current settings. Additionally, the 9350 will, for the first time, allow a customer to operate a full-duplex time division multiple access (TDMA) network running their normal traffic while simultaneously receiving a fully encrypted GBS data stream on a second demodulator. The benefit of this dual capability is the flexibility of having one modem manage both functions. Additionally, the 9350 will be compatible with all commercial satellites, from WGS to the new Inmarsat GX constellation as well as other high throughput satellites. The third product under development is part of the fastest-growing segment of our market, and that is the 980 airborne modem. The 980 eventually will replace our e8000AR/AE modems in early 2016. The airborne market has been growing rapidly in both the commercial and the government space. If any of you have taken a commercial flight lately with Internet access in the air, it is most likely you are using an iDirect modem. 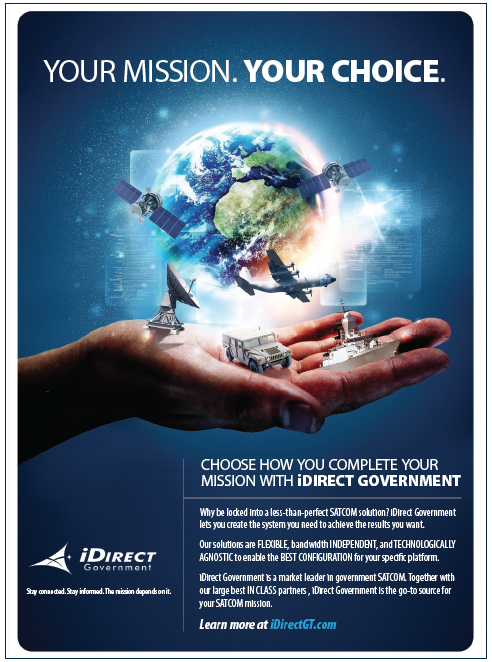 iDirect is by far the largest provider of in-flight Internet access in the world commercially, and we are rapidly becoming the same in the government space. 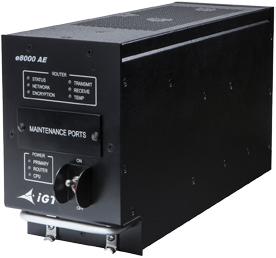 The U.S. government uses airborne assets a bit differently than the commercial world, however, and iGT has developed two current products (e8000AR and AE) to ably satisfy the government’s current needs while developing the new 980 airborne modem to satisfy future requirements. The 980, when complete, will be designed for operation as high as 55,000 feet (pressurized or unpressurized) and will allow for a monumental increase in data off of the aircraft. As with all of our products, it will be able to operate on all commercial satellites. I expect 2015 to be another exciting year for iGT, and I remain hopeful that the new Congress will be able to overcome the remaining challenges that developed from sequestration and get the government operating at a more pragmatic pace. If so, then we can continue the success of iGT and our partnership with the U.S. government. John Ratigan is the president of iDirect Government Technologies (iGT). He started the federal group for iDirect Technologies in 2003 and then established iGT as a wholly owned subsidiary in 2007. Under his leadership, the group has enjoyed tremendous growth, deploying thousands of terminals in support of Operation Iraqi Freedom and Operation Enduring Freedom, as well as many civilian networks. 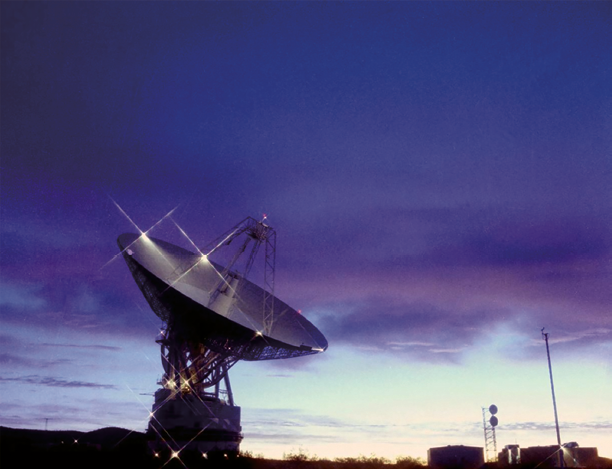 Ratigan brings more than 20 years of experience in the satellite communications arena. Prior to joining iGT, Ratigan ran the East Coast operations for both Fairchild Data and EFDATA, and eventually partnered in his own company that helped EFDATA grow from $20 million to $120 million in revenue and up to 700 employees in 2000. EFDATA became the preeminent leader in SCPC satellite technology in the late 1990s and provided the baseline knowledge and expertise that would later benefit his role with iGT and the migration of technology into TDMA. In addition to starting his own company, he held the position of senior vice president of North and South American sales for the start-up, Broadlogic, as companies started to run IP directly over satellite. MTN Government (MTNGOV) felt this slackening of demand as well; however, we used the year to incorporate a number of major shifts in our business to better serve government customers as we move forward into 2015. First, we positioned our company as a provider of a wider range of services by rolling out new offerings. These included a professional staffing initiative; a social media threat intelligence service; and an innovative portable secure operations center. We also completed certification of our new X-band antenna at our Santander, Spain, teleport, with our joint venture partner there to better serve military units operating in Africa and the Middle East. Second, we formed new partnerships that will enable us to compete more effectively in the future with the large global satellite operators. These firms are increasingly expanding beyond offering only transponder capacity to also providing a range of end-to-end network services that have historically been the sphere of the smaller service integration companies. Finally, we began offering more pricing options to our government customers so that they could pay for just the bandwidth they use. As our parent company, MTN Communications, purchases large volumes of satellite capacity around the world for its commercial maritime customers, we at MTNGOV have a large “inventory” that we can draw upon to suit the shifting needs and requirements of our government users. Our new offerings in 2014 centered on the growing threats to secure government communications by outsiders. We launched a new professional staffing business for the purpose of supplying cyber and intelligence experts to key government contractors. By offering experts in cyber and intelligence, we are able to help companies provide stronger secured communications and better intelligence analysis for government agencies. In 2014, we searched the market place for best of breed small companies and became a distribution partner for ZeroFox, allowing us to offer social media threat intelligence services to our customers. As social media threats become more advanced and extremist groups devise ways to infiltrate social media conversations, detecting and analyzing emerging threat vectors within social media is a major concern. Through this relationship, ZeroFox’s software programs enable us to support our government customers to better detect and respond to potentially threatening social media misinformation campaigns. A key U.S. government customer is in the process of implementing the service now and several others are considering adding the service as part of their overall system of risk management. We also began offering customers our scalable Redeployable Secure Operations Center (RSOC). These stand-alone, portable units enable varying levels of information protection, allowing users to confidently exchange sensitive and classified information. We are now establishing a reseller network for the RSOC in order to make this product more widely available to federal, state, and local government agencies. We had multiple RSOC sales in 2014 supporting several classified government programs. Each installation passed multiple accreditations including the Sensitive Compartmented Information Facility (SCIF) standards and Special Access Programs (SAP). We also enjoyed a number of contract renewals in 2014, including those that provide satellite services in support of intelligence, surveillance, and reconnaissance (ISR) for overseas military operations and for certain domestic activities of the Department of Homeland Security. Our 10-year relationship with the National Oceanic and Atmospheric Administration (NOAA) was also extended, this time as subcontractor to the small business prime contract holder, Knight Sky LLC. Under the contract, we provide satellite capacity to NOAA’s fleet of oceanic research and exploration vessels via Knight Sky. One of the ships, the Okeanos Explorer, conducts operations around the globe, mapping the seafloor and characterizing largely unknown areas of the ocean. To help map the roughly 95 percent of the sea bottom that is still unexplored, MTNGOV’s satellite, terrestrial, teleport and global MPLS backbone capabilities enable transmissions of video from the ocean floor to NOAA research centers. We believe that the shifts we have made in our pricing model will help us secure new government business as we move into 2015. Government demand for commercial satellite services is an expanding need, a function of the ever increasing size of data files, such as high-definition video, that have to be moved via satellite from remote locations to distant command centers. At the same time, the launching of more powerful, High-Throughput Satellites (HTS) is driving down the price per bit. In addition, new Ka-band constellations are coming on line in Medium Earth Orbit(MEO) and Geosynchronous Earth Orbit (GEO), offering the government customer an alternative to GEO Ku-band satellites. At MTNGOV, we are orbit and bandwidth “agnostic” because we contract for capacity from many satellite operators. MEO, GEO, Ku-, K-... the only difference to us is what is best for our customers. We are working with a number of satellite terminal manufacturers who offer hybrid terminals, capable of operating on any bandwidth the government user needs. By offering flexible, on-demand pricing, we will be able to better serve government agencies constrained by budget limitations. One of our goals in 2015 is to provide more aeronautical services and other ISR-suited airborne communications. Factors driving demand for these services include the rise of ISIS in the Middle East, increased vigilance along national borders worldwide, and the growing use of unmanned aerial vehicles for a broader range of government activities. We also feel that cyber threats will continue to grow, with risk management tools playing an increasing role in securing data. The convergence of secure communications and cyber/physical security fits well with our diversified portfolio of solutions for the government customer. Appointed to the NIAC by President Bush in 2002, Grayson is currently serving at the request of President Obama. An expert in cybersecurity and information sharing, she has participated in several comprehensive studies advising the president on the security of the nation’s critical infrastructures and information systems. Prior to MTN Government, Grayson held leadership roles at technology companies, focusing on finance, policy, regulatory compliance, and risk management.